Bags of basil have just started arriving in our weekly CSA shipments, and this week we finally got enough to make a batch of pesto. Pesto is something that I never really measure for, I just toss the ingredients into the food processor, pulse and taste until it is just right. It just so happens that today, quite by accident, I stumbled upon the best pesto I have ever made. I started by tossing in 3-4 large cloves of garlic and gave those a head start with a pulse in the food processor. I then add three or four big handfuls of basil leaves, a couple of handfuls of toasted pine nuts, a squeeze of fresh lemon juice, a dash of salt and freshly ground black pepper, and a big pinch of ground vitamin c, to keep it nice and green. I gave that a few pulses, and then drizzled in extra virgin olive oil through the feed tube until it formed a thick paste. Today, I slightly overestimated the amount of basil that I had, so in order to green the mixture up a bit, I decided to throw in a handful of Italian flat leaf parsley, and I gave it another whirl, and then decided that it needed a little bit more. As I reached for my second handful, I realized that, in my haste, it was actually cilantro that I had first grabbed (oops!). So I decided to add a handful of actual parsley. Once it was all combined, I finished it off by stirring in about a half a cup of Parmesan cheese. The accidental addition of a little cilantro and parsley really round out the basil flavor, and add a nice grassyness, that you wouldn’t necessarily be able to identify. (So, what started as a happy accident has now become my secret ingredient!) It is rich, fresh, nutty, tangy, and cheesy. It is almost spicy with that fresh garlic bite, and the lemon juice cuts through the richness of the oil and cheese. Pesto is a versatile flavor weapon in the kitchen that can be used in a million different ways. Perfect on its own spread on toasted slices of baguette (which I drizzled with olive oil, sprinkled with salt and pepper, and toasted in a 350º oven), over pasta, fish, or chicken, or as a filling for savory palmiers. Dee-licious! Enjoy! What a GREAT idea! I love happy accidents! I’m so hungry now. I’ll remember this for the next time in making pesto, thanks. 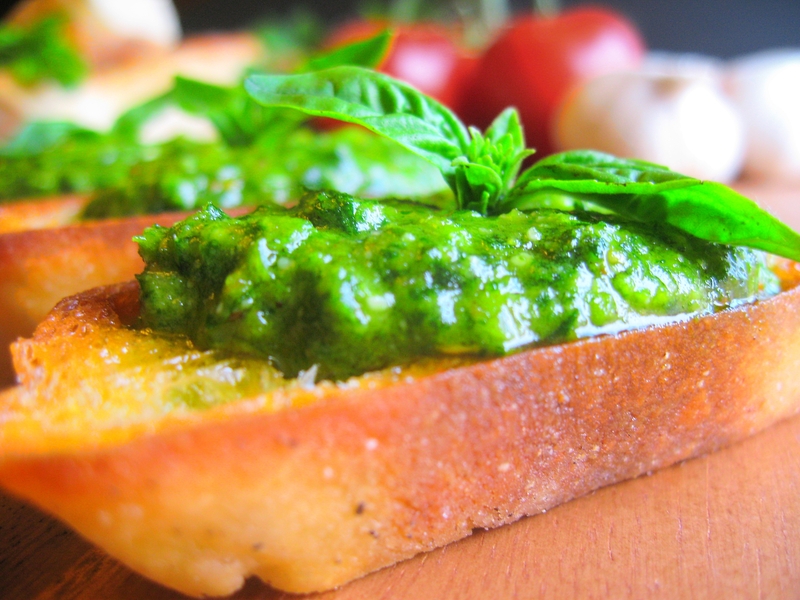 Pesto has been one of my favorite things since I was a kid! I love it on just about anything! I never would have thought to throw a bit of cilantro into the mix! The color is absolutely perfection! 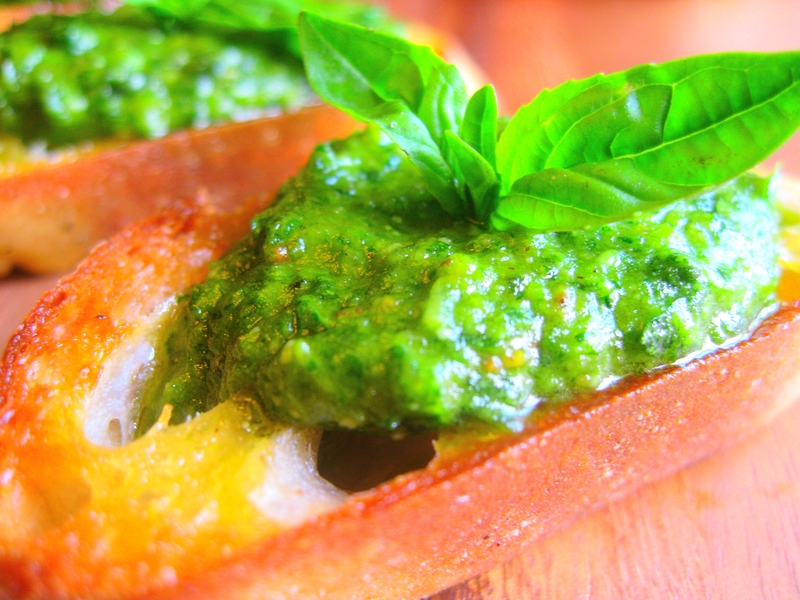 Basil pesto is such a delight! Your photos are so vivid! Next time you make some pasta in cream sauce. Add some pesto to the heavy cream along with some Parmesan cheese for an Alfredo Pesto Pasta! We got bags of basil in our CSA box too! And if that weren’t enough, we are also growing basil in our garden. Which has meant that we’ve been making lots of pesto. Not that I’m complaining. Can’t get enough. My csa is filled with basil this time of year and I love it. 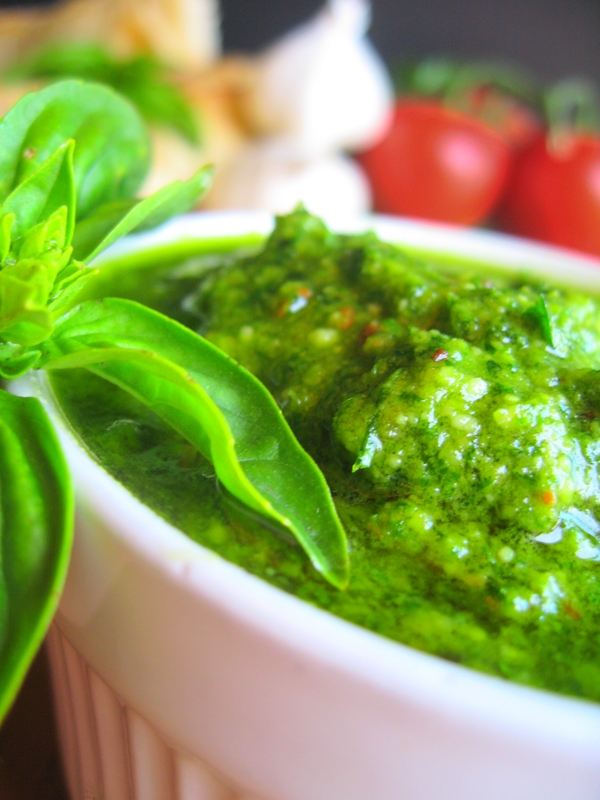 Delicious and colorful pesto! Thanks for the thoughts… I made my first batch of basil and it was missing that IT quality I like. I’ll be eager to try some of these other things. I wish I had a real food processor though. GORGEOUS! I have an overgrown basil patch in the back yard that is screaming to be made into pesto. thanks for the confirmation! And I haveto tell you that my experience with pesto was not so successful, but I will try that parsley thing!! by the way, I live in Italy and I love making fresh pesto. thank you. Thanks so much. The cilantro and parsley add such a nice freshness, without overpowering the basil. It really just rounds out the flavor. It’s definitely worth a try!